17 June 2011. What an extraordinary time at Chateau Cheval Blanc, where the estate just inaugurated a brand new cellar space, vat room, harvest reception area and tasting room. Many French language news reports out today from yesterday’s event. Such as this one. The design of the space is nothing short of amazing. Upon entering the site, visitors are struck by a purity of form and beauty, resembling the form of a large ship (80 meters by 35) in plain concrete, supported by arches, with a height of 7 feet below the ceiling. 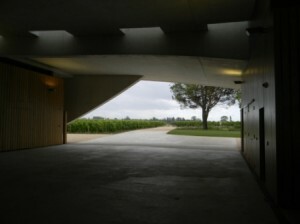 Enough open spaces allows for virtually no artificial light – and on either side, huge space for the reception of the first vintage for the new cellars, in 2011. 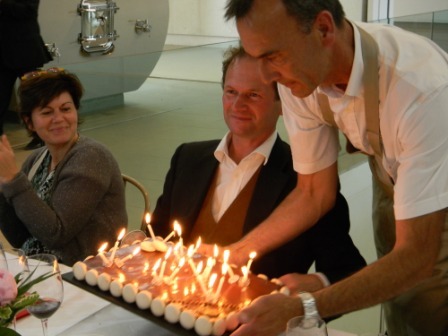 “I had fun doing this winery,” 66-year old French architect Christian de Portzamparc told guests at the ceremony yesterday. “I did not like claustrophobic spaces: it is important to see outside,” he said. 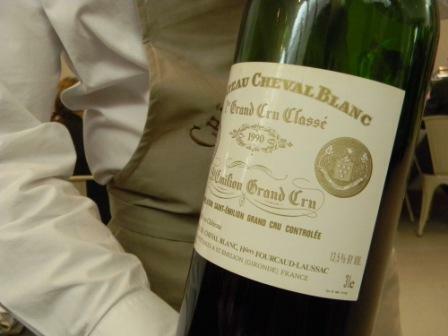 Lunch on 18 June was served to celebrate and assorted journalists enjoyed Cheval Blanc 1990 from double magnum bottles, but also a fine second wine Petit Cheval 2000 and Yquem 1986 Sauternes. Managing director Pierre Lurton also celebrated his 20th year with the estate and just before, guests were impressed with a Champagne reception on the roof of the new addition to the chateau: we enjoyed Dom Perignon 2002 from magnum bottles. 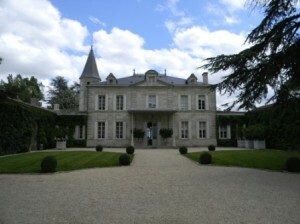 The view of other great surrounding properties was fantastic: including L’Evangile, La Conseillante and Vieux Chateau Certan in Pomerol. 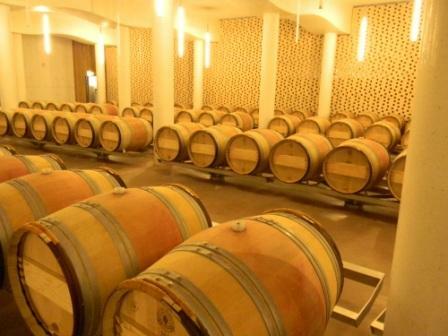 The new vat room features 52 new concrete vats, many of different sizes, to more precisely vinify wines from the estates specific vineyard parcels. Somewhat egg shaped, they underscore the organic nature of the construction, whose undulating shape recalls the hilly terrain of the surrounding area. The reception area somehow merges function with nature, with two open sides from which the grapes can be brought at 10 degrees C. No pre-fermentation maceration. But the grapes are fermented at that temperature. The next step, says Kees Van Leeuwen, consultant enologist – see video below – is to focus work in the vineyard, with perhaps a more meticulous focus on parcel selection. Very tender filets of milk-bred veal were served with double magnums of Cheval Blanc 1990. The nose exuded fresh cedar-like mint, the palate also echoed the truffles in the mashed potato and truffle (which was too quickly consumed, it was so delicious). Excellent depth on the aromas and flavors from this wine. The texture was alluring. Long finish. 96 points. How does that sound? More of this wine was served with the cheeses, and it matched best the aged comte, although I am not sure how old the cheese was aged. In any case, its subtle flavors were also a good match for the breed of this fine white horse. Finally, we enjoyed a fine Chateau d’Yquem Sauternes 1986, with cinnamon spice and bergamot tea like aromas and a rich if streamlined white-fruited palate. I recall enjoying this in Washington D.C. earlier this year, thanks to Chris Bublitz, from a half bottle if my memory serves correctly. This came from a full bottle and seemed livelier and fuller. 94. 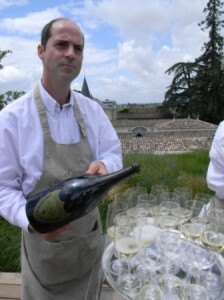 Seems like a fabulous event panos, I’ll have to endeavor to visit cheval on my next trip to bdx. ps – chris’ bottle was a full 750! It was indeed Faryan. 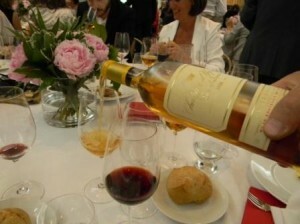 I wish the wine was not so expensive. 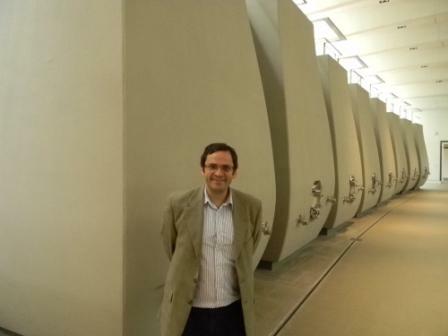 But the new facilities are great and of course Pierre Lurton is a really nice person.